The second the news broke that Belgium purchased $141 billion in Treasury bonds within a three month period in 2014, almost everyone understood who was really behind it and why, because Belgium simply does not have the resources to make a purchase of that volume. The federal reserve is behind Belgium’s extraordinary purchase, in order to disguise the financial downfall after Russia dumped a fifth of it’s treasury holdings. Russia has offloaded a fifth of its holdings of US Treasury debt in March at a time of heightened speculation that its assets would be frozen as part of sanctions over the crisis in Ukraine. It was the largest seller during the month while Belgium extended its big buying streak, according to US Treasury International Capital data released on Thursday. A decline of $25.8bn in Russia’s Treasury holdings to $100.4bn involved the selling of short-term bills. Russia isn’t the only one that has been dumping US Treasury bonds. Back in December China sold the second largest amount of US Treasury bonds, and once again, who jumped in? We know that Belgium didn’t have any money to buy $141 billion worth of bonds over a three month period. That sum comes to 29% of the Belgium GDP. So, they don’t have a surplus in their budget that is 29% of their GDP, and they don’t have trade or current account surplus in that amount. In fact, everything is in the red. Their budget deficit is in the red, and their trade and current accounts are in the red. So, Belgium didn’t have the money, and yet, they managed to pick up $141.2 billion in U.S. Treasuries over a three month period. So, where did they get the money? The fact is the US Dollar and economy is being propped up simply by being the reserve currency and countries are tired of the US using that to print money out of thin air with nothing to back it up. 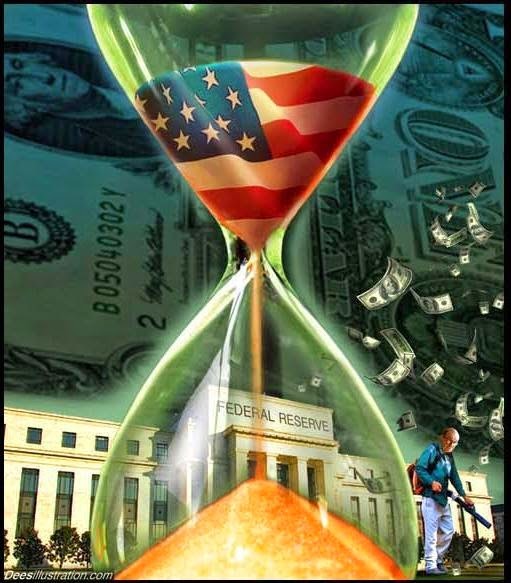 The economy is not growing, as is also explained in the video below, but to maintain the illusion, the administration, via the Federal Reserve, is actually laundering purchases through other countries in order to hide the impending downfall. The entire interview below is a must-see.